During most of the 20th century—until the 1970s—wages of American workers grew much faster than inflation. In the half-century after 1927 real wages of unskilled labor increased by a factor of 3.5, while wages of manufacturing workers, expressed in inflation-adjusted dollars, increased 4-fold. Then came a break. 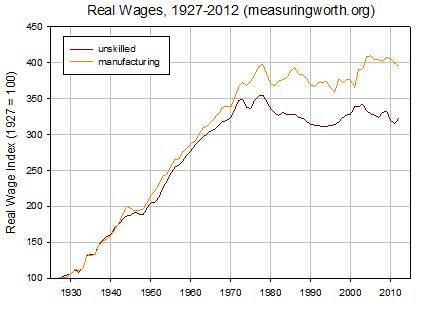 Last year, 2012, real wages of both unskilled and manufacturing workers were actually lower than in 1978. Why did the pattern of vigorous, virtually continuous growth change abruptly to one of overall stagnation in the late 1970s? The American economy did not stop growing in the late 1970. The productivity of the American worker continued to increase. Yet, suddenly American workers stopped sharing in the fruits of economic growth – the gains went elsewhere. Americans are not a particularly envious people and many, if not most, would not begrudge the rich the enjoyment of their wealth, especially if it’s a result of their own (rather than their parents) efforts. We know that earners of top incomes tend to work harder, put in longer hours, and sacrifice leisure and quality time with their families. Sociological surveys and behavioral experiments indicate that Americans are much more tolerant of inequality (especially if it is ‘earned’), even when compared to other Anglo-Saxon countries, such as Australia. The problem, however, is that the proverbial tide doesn’t just lift the boats of the wealthy higher. It is that poor and middle-class families are actually sinking. In reality, the ‘inflation-adjusted dollars’ just don’t tell us the whole story about what has been happening with the middle class. How can you count yourself as part of middle class if you cannot afford to buy your own house? To put your kids through college? To afford medical insurance? Yet the costs of all three of these items have been increasing faster than inflation. So when you consider the purchasing power of wages not in terms of an abstract basket of consumables that the Bureau of Labor Statistics has put together, but in terms of big items that make ‘being middle-class’ meaningful, what looks like stagnation of real wages really means decline. The middle class has been sinking ever since the late 1970s, but it became glaringly obvious only since 2000, when household incomes (that is, the summed earnings of the husband, the wife, and, in some cases, their adult children who haven’t moved away) started plunging, even when adjusted with the official inflation. 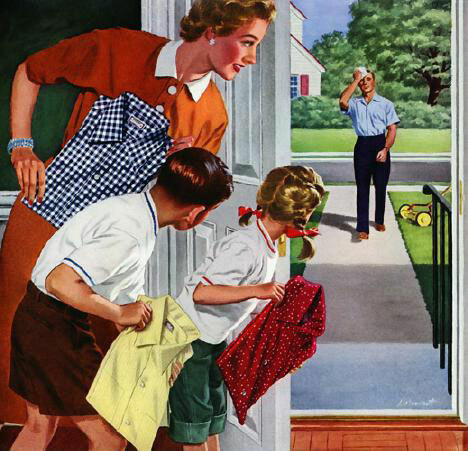 The sinking incomes of middle-class families became a focus of discussion last Fall during the presidential campaign. David Leonhard wrote a series of articles for the New York Times, searching for explanations of the decline. I respect Leonhard (I’ve been following his writings for many years), but I am not satisfied with his conclusions. Indeed, quite a “thicket of economic forces”. Apart from my disagreement with several of these specific conclusions, what I find highly unsatisfactory is the ‘piece-meal’ approach to this question. There is no unifying theoretical framework within which we could weigh the importance of some factors against others. And it’s not just Leonhard’s articles, in my readings of economic literature I have, so far, not found any technical articles that attempt to present such a unified framework (I would be exceedingly grateful if someone can direct me to such articles, if I missed them). On the contrary, some economists study the effect of immigration, others focus on education, and yet others on globalization. The root problem is that the question of why real wages experienced a turning point in the 1970s cannot be answered with purely economic methods. As I argued in my Aeon article, we need a more sophisticated model that takes into account both economic forces and cultural change (the latter, curiously, seems to be missing from David Leonhard’s list of important factors). There I also outlined the logic of a possible explanation, based on the structural-demographic theory. I am currently fleshing out the details of how the structural-demographic model can account for the turning point of the 1970s (this is part of the book that I am writing on the structural-demographic analysis of American history). The next few blogs will provide the details. I think Scott Winship has argued somewhere (can’t find it at the moment) that claims about real wage stagnation survive only by ignoring growth in benefits, changes in household composition, and some other stuff I can’t remember. Of course, that doesn’t mean that growth hasn’t slowed, or that workers aren’t capturing the entirety of the gains in productivity over that period, or that the vital goods that matter for a structural-demographic analysis aren’t being better provided, but I’ve always felt there’s something exaggerated about claiming that workers are no better off in material terms than we were 30 years ago. Fred, thanks for this comment. I plan to devote a complete blog to disentangling complex issues surrounding differences between wages and incomes, the issue of benefits, how methods of estimating inflation affect the conclusions, etc. To jump to the conclusion, the stagnation/decline is real. But wait until I present the data, and I will be very interested in your response. I’ll be curious to see your consideration of the role of labor unions and, more generally, unionism since it doesn’t necessarily fit strictly as an “economic” or “cultural” factor. To go back a bit farther than the 70s, plots for union density in the US would appear to correlate with trends for general welfare and/or the relative lack of wealth inequality. From this perspective, at least, relatively high union density has been argued to have spillover effects to other parts of the economy. For a final, unrelated aspect related to unions: it’s fair and reasonable to assume there are non-linear dynamics in play and that once union density reaches (or falls below) a certain level in certain markets (geographical-, employer-, or industry-specific) then momentum will go in one direction or another. In any case, wage stagnation in general is certainly a worthy topic! Good point. Most generally, I am thinking about the dichotomy between ‘economic’ and ‘extra-economic’. The latter combines such diverse factors as changing social norms and insitutions (which I think of as ‘culture’) and power-relations. More on this in the next post… this is a big topic. I’d think lowering tax rates on investment income has a lot to do with this. OK, but it’s just one strand in the thicket. How do we tease all these different factors apart? Have you read Timothy Noah’s The Great Divergence? He first wrote it up as (40 pg long!) series of articles for Slate. As a side note, everybody forgets about the Share holder Revolution. The introduction to Ashwin Parameswaran’s “Technological Unemployment Admist Stagnation” discusses this well. Noah’s series (which was recently published as a book) is a very valuable contribution to the debate. But again, he uses the ‘shopping bag’ approach, just like Leonhard. He has a list of possible causes, goes down it, and (rather arbitrarily, I think) decides which is important and which is not. I eagerly await your data. Some food for thought as you develop it. Here is data from the Federal Reserve Bank Of Minneapolis VP with detailed data arguing that wages have actually increased substantially. Here is input from economist Richard Burkhauser and his team of researchers at Cornell University on a similar position. Finally, it is important that even if Fitzgerald and Burkhauser are wrong (which I assume you can show), that we look not just at American first world workers, but workers worldwide. The most significant trend of the past 30 years is the reach of global markets. We gained a billion or so available workers who were previously excluded due to politics or technological reasons. Worldwide, the globalization movement has resulted in phenomenal and unprecedented gains to those laborers most in need. In other words, rich first world labor now has to compete with third world laborers who were previously excluded. More people rose out of poverty in past decade than ever. American wage trends and global poverty are reasonably inversely correlated. Thanks for these links. My main focus in the next blog will be on wages, but later in the series I will deal with issues of wages vs. household incomes and how different measures of inflation affect the trends. 1) Am I the only one confused by the focus on incomes seems to always exclude the effects of transfers? We have increased transfers substantially over the past 40 years. Today, we are delivering almost a trillion dollars a year in means tested transfers to lower and middle class families. We have effectively converted to a model of primarily wages, to one of wages, benefits and income transfers. Any evaluation that ignores these effects, both in terms of the actual welfare of the poor, and on incentives (employment, low skilled wage rates, and so on) is going to be missing the big picture. One trillion dollar gorilla in the corner. 2). I am also very skeptical of arguments that the demise of unions could undermine the total income of labor. Unions may be great at offsetting corporate coercion, and at bargaining more efficiently, but these are not going to make any significant differences. The logic on union gains to labor are premised on capturing a larger share of profits. But this falls apart long term as lower profits implies lower returns and thus lower investment, fewer factories, fewer competitors, and fewer jobs. Unions DO indeed lead to lower profit AND lower growth within their industry. In evolutionary terms, they drive their industries to extinction (small differences in growth lead to virtual irrelevancy over time). But it gets even worse, the immediate effect of higher union wages is also higher prices for all of us and increased unemployment for those unable to get into the union. If unions can somehow non coercively increase wages for those in the union, then they do so at the expense of the rest of us not in unions. The same logic applies to minimum wages of course. Do you have a reference to the claim that unions lead to lower growth within inudstries? I have seen it, but unfortunately did not save my sources. Here is what Google delivers.. Here is the data on growth rates. Union industries are shrinking employment by 2.9% a year, while non union industries are growing at 2.8% annually. Not sure if this includes the effects of mass movement toward right to work states or not. See page 13. It looks that there are unions and unions. Take Volkswagen which is a hugely successful company however you look at it – profits, growth within its industry and so on (I read regularly about VW because I own the stock). Check it out – VW has it all. Excluding its joint venture plants in China, VW’s only nonunion factory is in Chattanooga, Tennessee which is a “right to work” state, of course. In Germany all VW workers are members of IG Metall, Germany’s largest union. VW workers in Germany do capture a larger share of profits in the form of higher wages comparing to their American counterparts to say nothing about two month paid vacations and other benefits too many to list here. Last year when VW showed stellar performance every worker got a bonus to the tune of 10,000 (ten thousand) euros. Not just the CEO, every worker got the bonus! I see it as an example of social cooperation. And social cooperation translates into great economic performance. Couldn’t agree more with Voron. In addition, when workers are well paid, they can save more, and these savings will translate into investments. The rich, on the other hand, don’t save everything they earn – they can waste a lot of their income on conspicuous consumption, with deca-millionaires attempting to match the extravagant consumption of centi-millionaires, and those trying to keep up with billionaires. It is well-known that corporations are currently sitting on mountains of cash and they don’t know where to invest it. Pay some of that up as worker salaries, which will translate into a huge stimulus to the economy, and all will benefit. I am not saying anything like ‘power to the people’ – far from it (I was raised in the USSR and saw from inside how that worked). But there’s got to be a balance, and right now it is way out of whack. German workers probably save part of their earnings. After all, Germans have a reputation of great savers. But American workers spend it all on consumption and then borrow to spend even more. The US economy is two thirds consumption. I never thought that you advocate ‘egalite, fraternite’. To continue the VW example, I think it’s money well spent to reward everyone from the top down as the great year performance was due to their collective effort. But the CEO bonus is in the millions of euros, and it should be. The right balance is the key. But where does it lie? How to find it? My guess is that in every country it will be different due to cultural differences. Thank you. That provides further support to the Apple protection argument I gave (http://fauceir.wordpress.com/2013/04/05/stagnation-of-real-wages-in-western-countries-evolutionary-analysis/). Really, I didn’t know the fact. I agree that the heart of the relationship between labor and capital is to cooperate together to solve consumer problems. We have nested hierarchies of cooperation. Competition is actually between production firms (for relationships with consumers) and between workers (for jobs). Once the true level of competition is clear, the myth of “unions lead to a bigger slice of the pie for workers” starts to unravel. I strongly support voluntary, non-exploitative, union membership. When done well, it could lead to more efficient bargaining and better productivity. My referenced data just reveals that in the US, unions have not led to higher productivity on average. They HAVE led to a larger share of profit going to workers, at the expense of growth and investment, and thus long term to the detriment of the industry. The long term effect of unions which do not increase productivity (other than the above exceptions) is either marginal, or comes at the expense of non union labor, the less fortunate, capital and consumers. VW sounds like a great social experiment. I hope their model proves successful and is widely replicated. To do so, it is essential that they actually serve consumers better than alternative management/labor organizations. Personally, I have preferred what Toyota and Lexus have been able to deliver. That is me though. I will not argue with that. I don’t know the particulars, but the history of trade-unionism in the US must be very different from Germany’s. I think, one can safely bet that none of the German unions has such a colorful, to put it mildly, history as, let’s say, Teamsters. That’s why I said that there are unions and unions. Not long ago the IG Metall President sent a letter to VW Chattanooga workers ‘strongly’ recommending them to join The United Auto Workers. I don’t know anything about the UAW except that it is not popular among the Chattanooga workers. Perhaps, it has a certain reputation, so they were probably right to meet this letter with laughs and jeers. On the other hand, historically, the U.S. South has been hostile to unions in general. I guess, in Chattanooga VW has been following its strategy to keep its workers happy – happy the American way. So the workers don’t want it any better. However, if I were a Chattanooga worker and were offered to join an American branch of IG Metall ( not the UAW ) with its record of being able to find in cooperation with the management the best solution for everybody ( preferably with German organizers dispatched to Tennessee :)), I would consider it. Because it all works only when it’s done well, as you said. It is not just VW. It is the general German model of organizing big business. Daimler and BMW work the same way. And Siemens, BASF and all the others. It’s proven by time and works quite well for them. Call it an experiment, but at the level of a national economy, not just one corporation. I can tell you more. The VW’s board member in charge of human resources is a union representative. It is the general German practice to have a union representative on the board of directors. Something unthinkable in the American context, right? Where even shareholders don’t have a say about the amount of the CEO compensation ( hopefully, soon we will ). I especially like the way labor is represented on the board. I suspect American firms have way too much “nepotism”, where CEOs across various firms serve on each other’s boards in a vast good ol’ boy network. Reading Peter’s statement of intent, and then two of the comments, I am searching for a term that represents the non-cogent mass of cultural apparatus that ballasts a cogent argument. Cardiffkook and Robin represent opposing world views – that is, two mutually repellent non-cogent masses of cultural apparatus. Their cogent arguments are selected to buttress their world views. I am a third person. I share the world view of one, and deplore the world view of the other, whose arguments thus, to me, are deeply and obviously flawed. It is in amongst this chaos that Peter searches for what is actually the case. Chapeau! I know that post-modernists will say that I delude myself, but I honestly think that it is possible to do good science, and let the chips fall whichever way they will – irrespective of ideology. As usual I wrote a comment on my website (http://fauceir.wordpress.com/2013/04/05/stagnation-of-real-wages-in-western-countries-evolutionary-analysis/). As you will see in the next few days, I come to a diametrically opposed conclusion.